What is specific resistance, symbolized by the Greek letter "rho" (r)? Ask your students, "Why is it important to have a quantity called specific resistance? Why don't we just compare the "resistivity" of different substances in regular units of ohms? A beneficial exercise to do with your students is to analyze this equation (and in fact, any equation) qualitatively instead of just quantitatively. Ask students what will happen to R if r increases, or if l decreases, or if A decreases. Many students find this a more challenging problem than working with real numbers, because they cannot use their calculators to give them qualitative answers (unless they enter random numbers into the equation, then change one of those numbers and re-calculate - but that is twice the work of solving the equation with one set of numbers, once!). The data for this table was taken from table 1-97 of the American Electrician's Handbook (eleventh edition) by Terrell Croft and Wilford Summers. It may come as a surprise to some students to find that gold is actually a worse conductor of electricity than copper, but the data doesn't lie! Silver is actually the best, but gold is chosen for a lot of microelectronic applications because of its resistance to oxidation. Ask your students to share their sources for data: values of r, cross-sectional area, etc. A spool holds an unknown length of aluminum wire. The size of the wire is 4 AWG. Fortunately, both ends of the wire are available for contact with an ohmmeter, to measure the resistance of the entire spool. When measured, the wire's total resistance is 0.135 W. How much wire is on the spool (assuming the spool is at room temperature)? 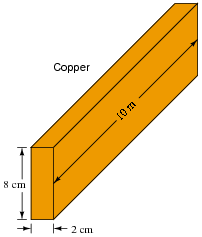 The cross-sectional dimensions of a copper "busbar" measure 8 cm by 2.5 cm. How much resistance would this busbar have, measured end-to-end, if its length is 10 meters? Assume a temperature of 20o Celsius. Calculate the end-to-end resistance of a 20 meter length of copper wire with a diameter of 0.05 cm. Use 1.678 ×10-6 W·cm for the specific resistance of copper. Also, calculate the amount of power that would be delivered to the load resistor if the wires were superconducting (Rwire = 0.0 W). Not only is this question good practice for series circuit calculations (Ohm's and Joule's Laws), but it also introduces superconductors in a practical context. Calculate the load voltage, load power dissipation, the power dissipated by the wire resistance (Rwire), and the overall power efficiency, indicated by the Greek letter ëta" (h = [(Pload)/(Psource)]). The maximum allowable (total) wire resistance is 8.681 W.
A common mistake for students to make here is entering 90% as "90" rather than as "0.9" in their calculators. Several steps are necessary to solve this problem: Ohm's Law, algebraic manipulation of the specific resistance equation, and research into wire sizes. Be sure to spend adequate time discussing this problem with your students! The concept of a generic "load" is any component or device that dissipates electrical power in a circuit. Often, generic loads are symbolized by a resistor symbol (a zig-zag line), even though they might not really be a resistor. A strain gauge converts micro-mechanical motions (ßtrain") into electrical resistance changes. Typically, strain gauges are used to measure the stretching, compressing, and twisting of metal components under stress. How does the conductance (G) of a conductor relate to its length? In other words, the longer the conductor, the (fill-in-the-blank) its conductance is, all other factors being equal. Follow-up question: how does "conductance" (G) mathematically relate to resistance (R), and what is the unit of measurement for conductance?